The Jamaica Center BID is the proud recipient of a three-year, $300,000 Avenue NYC grant from the NYC Department of Small Business Services. More information on Avenue NYC can be found here. To better understand the Commercial Revitalization initiatives that are needed in Downtown Jamaica, this grant presented us with the opportunity to conduct an in-depth Commercial District Needs Assessment (CDNA) over the last eight months. The CDNA is a customized analysis of Downtown Jamaica’s demographics, small businesses and retail environment conditions, physical environment, community involvement, and other key indicators, to determine the specific needs of the commercial corridors within Downtown Jamaica. We’re happy to announce that we’ve completed the CDNA portion and are now eager to share the results of this data collection effort, along with key takeaways and next steps. As part of this process, we would like to invite you to attend a workshop to provide your valuable input and feedback on our proposed next steps and early action programming. We look forward to sharing our study with you, and will appreciate your help and participation in maximizing this important work on behalf of Downtown Jamaica. 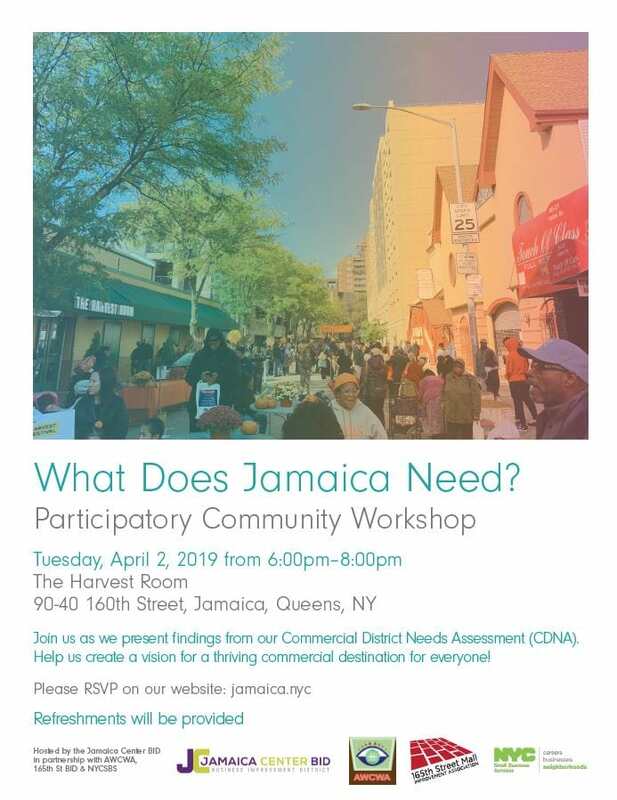 Please reach out to Jahnavi Aluri(jaluri@jamaicacenter.org), the Avenue NYC Program Manager at the Jamaica Center BID with any questions or concerns.